Legendary saxophonist Kirk Whalum enjoys with albums like For You (1998), Unconditional (2000), Kirk Whalum Performs the Babyface Songbook (2005), and Roundtrip (2007) the Smooth Jazz community. His new praline is entitled Everything Is Everything and released on Mack Avenue Records August 31, 2010. Kirk has dedicated this album to Danny Hathaway, who would be 65 years old on October 1, 2010. John Stoddart on Fender Rhodes, Shedrick Mitchell on organ, guitarists Jef Lee Johnson and Larry Campbell, bassist Christian McBride, percussionist Bashiri Johnson, and drummer John Robert support Kirk's new project. Kirk introduces into his new album with Giving Up. An intimate melody conjuring the nostalgic atmosphere of Donny's time. Those, who are familiar with his music will love the wonderful arrangements of Gil Goldstein and John Stoddart. The rising horns in combination with Kirk's leading sax is symptomatic for the style of that decade. 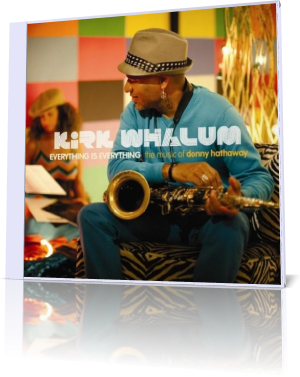 On Someday We'll All Be Free Kirk's sax follows the intonation of the great singer. Keep on walking tall, hold you head up high. Lay your dreams right up to the sky. This point of confidence is also Kirk's message which he transmits with his sax. We're Still Friends features Philadelphia soul singer Musiq Soulchild. He added Soulchild to his name to represent the legacy of past soul artists. Musiq has an impressive feeling for Donny's style, which he perfectly interprets in his own performance. Rick Braun (trumpet) and Kirk Whalum (sax) play a harmonic duet on Love, Love, Love. Both perform often together on numerous events. Fantastically mastered their reading. A Song For You was originally performed by rock singer-songwriter Leon Russell, before Donny Hathaway covered the song in his own way. Kirk builds with Gil Goldstein an exciting orchestral rendition. Hathaway wrote the instrumental Valdez in the Country during the late '60s as part of Chess studio groups and released it on his album Extension of a Man (1973). The strong melody motivated great artists like George Benson, Gerald Veasley, Lee Ritenour to cover this song. Kirk's rendition emphasizes the Latin character of the song. Je Vous Aime (I Love You) was one of Hathaway's great love ballades on his debut album Everything Is Everything (1970). With great respect to the original Kirk celebrates his own treat of this song. You Had To Know is Lala Hathaway's tribute and homage to her beloved dad. The up-tempo Tryin' Times offers a faster pace than the original and showcases pedal steel guitarist Robert Randolph in an attitude of rock. We Need You Right Now highlights Donny Hathaway's work as soulful gospel singer especially on his album In Performance (1980). Voices Inside (Everything Is Everything) is the final jam of some of the best musicians of the contemporary jazz scene. Uplifting and jiving. Kirk's tribute to Donny Hathaway is the ideal way to familiarize the younger generation to this great singer with historic dimension. Kirk brings Donny's music to a new contemporary and modern level.